April 4, 2016, 9:30 a.m.
Events like its upcoming Obscura Day are meant to help the site’s digital readers discover places they previously only read about. By Ricardo Bilton @rbilton April 4, 2016, 9:30 a.m.
For Atlas Obscura, the reader journey begins on the web and ends at The Great Wall of China, a Southern California mining cave, or even a pigeon museum in Oklahoma City. The locations are a few of the 150 places Atlas Obscura readers will visit as part of Obscura Day, the site’s annual event dedicated to the world’s most unique and unusual locations. The event, which will take place in 39 states and across six continents, is focused on building real-world communities around the site’s digital audience, which now sits at roughly 3 million unique visitors a month, five times a year ago according to comScore. The site ran over 250 events in 2015 alone. While many publishers are looking to events as a way to shore up their businesses in the face of dwindling display ad revenue, the idea of engaging readers is core to the Atlas Obscura approach, particularly on the web. One of the site’s main attractions is the Atlas, a compendium of over 9,000 locations sourced in large part from Atlas Obscura readers. Over 25,000 people have contributed to Atlas so far, with 110,000 people creating accounts to share places they’ve been to, or would like to visit. The rest of Atlas Obscura’s content comes from its seven-person editorial team, which also vets user contributions. That kind of engagement is hard to come by these days. While many publishers have successfully harnessed Facebook to attract new readers, many still struggle with turning those flyby readers into actual engaged audiences. Atlas Obscura hopes its focus on community — both offline and online — will make it an exception. Another core part of the site’s real-world community are the local “societies” it’s built in Washington, San Francisco, Los Angeles, Philadelphia, New York, and Illinois. Each group is run by a combination of a local society lead and a handful of Atlas Obscura “field agents,” city locals who are in charge of finding and organizing trips to interesting locales with other society members. The challenge, though, is turning that engagement into cash. While Atlas Obscura expects thousands to attend its Obscura Day events the year, the venture isn’t an especially significant moneymaker so far, Plotz said. The average walking tour, for example, attracts around 10 to 75 people, so they’re hard to scale. Instead, the events largely serve as what Plotz calls “grassroots marketing,” a way for Atlas Obscura to get its brand in front of new people and helps solidify its relationship with existing readers. Still, in the short term, Atlas Obscura expects the bulk of its revenue to come from sponsored content and, to a lesser extent, banner ads. (The site’s relatively small audience means that it will be hard to build a significant display business.) Last year, the Illinois Office of Tourism sponsored stories that highlight interesting and unusual places in the state. Likewise, for a series sponsored by camera maker Olympus, Atlas Obscura hired professional photographers to create photo essays using the company’s equipment. Ultimately, Atlas Obscura is betting that it will succeed with both readers and advertisers because it represents something universal, much like National Geographic captured the hearts and minds of would be explorers over the last 127 years. “Everyone loves that feeling of discovery and exploration. Not a single person doesn’t get a thrill from seeing something new and surprising,” Plotz said. POSTED April 4, 2016, 9:30 a.m.
Bilton, Ricardo. 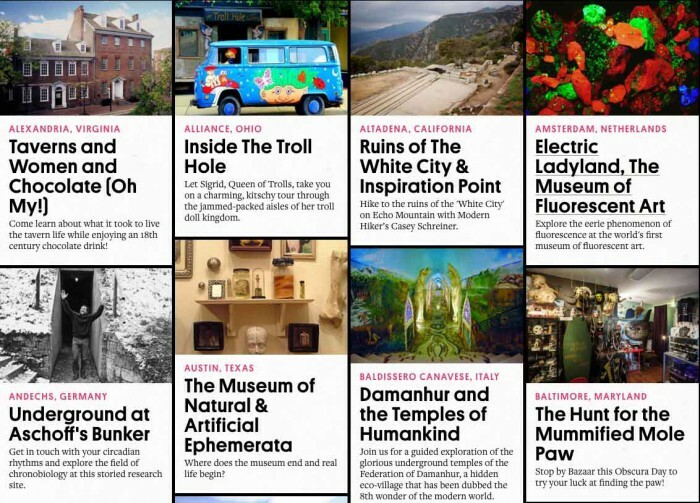 "How Atlas Obscura helps its web audience discover the real world." Nieman Journalism Lab. Nieman Foundation for Journalism at Harvard, 4 Apr. 2016. Web. 20 Apr. 2019. Bilton, Ricardo. "How Atlas Obscura helps its web audience discover the real world." Nieman Journalism Lab. Last modified April 4, 2016. Accessed April 20, 2019. https://www.niemanlab.org/2016/04/how-atlas-obscura-helps-its-web-audience-discover-the-real-world/.